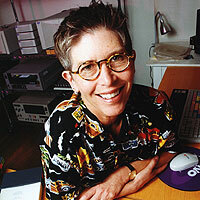 Pam Walton is an award-winning independent documentary filmmaker, whose work looks at gay and lesbian lives in mainstream culture. Her work has screened at the Museum of Modern Art in New York City, at the Margaret Mead Film Festival, and has been included in the International Documentary Association?s Theatrical Documentary Showcase. Her film Out in Suburbia was the audience favorite documentary at the SF International Lesbian and Gay Film Festival in 1989. Gay Youth received a Silver Apple from the National Educational Film and Video Festival in 1992. Liberty: 3 Stories about Life & Death was the Best Short Documentary at Cineffable, the Paris Lesbian Film Festival, and won the National Mature Media Silver Award in 2005. Raging Grannies: The Action League, completed in 2009, won the 2009 National Mature Media Merit Award and an Honorable Mention at Big Muddy Film Festival. Walton has earned 2 masters degrees from Stanford University, one in education and the other in communication (film & video production).